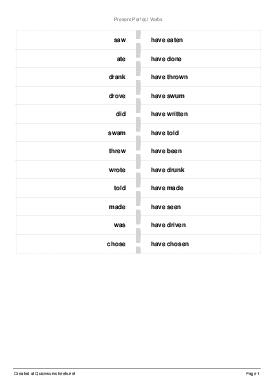 Simple past and present perfect (have + past participle) verb forms for some common irregular verbs. After students have finished matching the simple past and present perfect verb forms, instruct them to write some example sentences using both the simple past and present perfect tenses. e.g. "In the last month I have seen three whales in the bay." "Yesterday I saw a great movie."